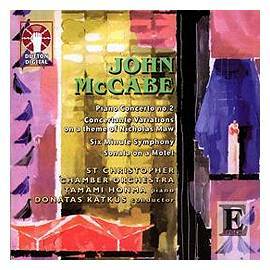 The new recording on Dutton Epoch (CDLX 7133) of McCabe's Piano Concerto No 2 was chosen by Gramophone editor James Jolly as one of his Choice CDs for March 2004, and featured on the magazine's cover CD. The record, which stars Tamami Honma, with the St Christopher Chamber Orchestra from Vilnius, Lithuania, conducted by Donatas Katkus, also contains three of McCabe's string orchestra works: Concertante Variations on a theme of Nicholas Maw, Six-minute Symphony, and Sonata on a Motet, which is based on Tallis's great 40-part motet Spem in alium. Guy Rickards wrote, in his Gramophone review of the same date, "Tamami Honma ... plays brilliantly, as do the splendid St Christopher Chamber Orchestra of Vilnius under Donatas Katkus's smart direction. Excellent sound, too. Very strongly recommended." In International Record Review, March 2004, Piers Burton-Page wrote "I have not previously come across the names [of the performers] ... But in these four pieces by John McCabe they have produced a visiting-card of high quality ... All in all, McCabe demonstrates once again that he is a fine and under-valued composer. I hope this new CD (in excellent sound, incidentally) brings more of the recognition that his music deserves."